(1962) "You've Really Got a Hold on Me"
(1962) "A Love She Can Count On"
"You've Really Got a Hold on Me" is a song written by Smokey Robinson which became a 1962 Top 10 hit single for The Miracles on Motown's Tamla label. One of the Miracles' most covered tunes, this million-selling song received a 1998 Grammy Hall of Fame Award. It has also been selected as one of The Rock and Roll Hall of Fame's 500 Songs that Shaped Rock and Roll. It was covered by English rock group the Beatles on their second album, With the Beatles and many other musicians. "You've Really Got a Hold On Me" was written by Smokey Robinson while in New York in 1962 on business for Motown; he heard Sam Cooke's "Bring It On Home to Me", which was in the charts at the time, and — influenced by it — wrote the song in his hotel room. The song was recorded in Motown's Studio A on October 16, 1962 with Robinson on lead vocals, and Miracles' second tenor Bobby Rogers on harmony co-lead. Robinson was the producer, and he had Eddie Willis and Miracle Marv Tarplin share the guitar parts. The song was released on the Tamla label on November 9, 1962 as the B side to "Happy Landing". "Happy Landing" charted regionally; however, the nation's Dee-Jays flipped the record over, because they liked "Hold On Me" better. With "You've Really Got a Hold on Me" as the A side, the single reached the Top 10 on the Billboard Hot 100 Pop chart, peaking at number eight, and was a number-one smash on the Billboard R&B singles chart during the winter of 1962-63. The Miracles' original version is a 1998 Grammy Hall of Fame inductee. It was also the group's second single to sell over a million copies, after "Shop Around". 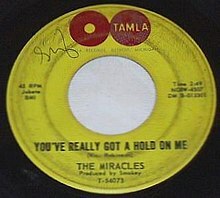 It was included on the album The Fabulous Miracles over three months after its release. The Miracles can be seen performing the song live on stage at the Apollo Theatre in New York (1963) on the Motown/Universal DVD release: Smokey Robinson & The Miracles: The Definitive Performances 1963-1987. This filmed performance, according to the DVD's liner notes, is the only known recorded live footage of the group with original Miracles member Claudette (Mrs. Smokey) Robinson. They also performed it live at the Santa Monica Civic Auditorium the following year (1964) for the American International Pictures concert film, T.A.M.I. Show. It was also chosen for the soundtrack of the award-winning 1964 Ivan Dixon film, Nothing But a Man, and many others (see below). Smokey Robinson himself also performed a rewritten version of it on Sesame Street alongside a grabby, feminine-looking Muppet letter "U", who wouldn't stop trying to grab Smokey, with such lyrics as "U stands for uptight/That's how I'm feelin'/Bein' grabbed by a letter is/Unappealin'". The Miracles performed the song on a 1964 telecast of the ABC television series Shindig!, and in 1983, the group also performed it, 21 years after they originally recorded it, on the Emmy-winning NBC Television special, Motown 25: Yesterday, Today, Forever. "You Really Got a Hold on Me" [sic] was the first track recorded for the Beatles' second United Kingdom LP, With the Beatles, and features John Lennon and George Harrison on lead vocals with Paul McCartney on harmony vocals. The Beatles acquired an imported copy by the Miracles and included it in their repertoire early in 1963. In a 1968 interview, Smokey Robinson reported that he liked their cover. The Beatles recorded the song on July 18, 1963. This session took place while Please Please Me was still at number one in the album charts four months after its release, and in the midst of a rigorous touring schedule that also had to include BBC sessions for radio and television. It was completed in seven takes, four of which were complete. The group then recorded four edit pieces. The final version was an edit of takes 7, 10 and 11. The Beatles also recorded "You Really Got a Hold on Me" on four occasions for BBC radio in 1963. One of these, from July 30, 1963 was included on the Live at the BBC collection. A live version recorded in Stockholm, Sweden in October 1963 was released in 1995 on Anthology 1. The song was performed once again in 1969, during the Let It Be recording sessions, and featured in the 1970 documentary film, Let It Be. The Supremes did a version which was produced by Berry Gordy with Hal Davis and Marc Gordon doing the mixing, and appeared on their 1964 album A Bit of Liverpool. Group member Mary Wilson sang in close unison with Diana Ross's lead in their version. The Temptations' version, produced by Smokey Robinson, was included on their 1965 album The Temptations Sing Smokey. Eddie Kendricks sang lead vocal with David Ruffin providing harmony co-lead vocal on verses 1 and 2; Paul Williams provided vocals on close harmony on the final verse. The Zombies covered the song in their 1965 debut LP Begin Here. Barbara McNair recorded an unreleased version in 1968, and in 1969 the Jackson 5, with Michael Jackson singing lead, recorded an unreleased track that was originally intended for their first album Diana Ross Presents The Jackson 5. Laura Nyro recorded the song in 1971 on her album, Gonna Take a Miracle. Michael Jackson recorded a solo version in 1973; however this remained unreleased until 1984's Farewell My Summer Love. These versions were among the first recorded that did not have dueling unison leads. The Small Faces covered the song for their album From the Beginning in 1967. Eddie Money covered this song on his 1977 debut album. Bernard Edwards covered the song on his solo album Glad to Be Here in 1983. Country music artist Mickey Gilley covered the song in 1984. Produced by Jim Ed Norman, and released by Epic Records, Gilley's version peaked at #2 on the Billboard Hot Country Singles chart and #1 on the RPM Country Tracks chart in Canada. Smokey Robinson himself also performed a rewritten version of it on Sesame Street in 1985 alongside a grabby feminine looking Muppet red letter "U", with such lyrics as "U stands for uptight/That's how I'm feelin'/Bein' grabbed by a letter is/Unappealin'". Mike and the Mechanics covered the song for their album Beggar on a Beach of Gold in 1995. Cyndi Lauper covered the song for her 2003 studio album At Last. She & Him covered the song on their debut album Volume One in 2008. Rod Stewart covered it as well for his album Soulbook in 2009. Phil Collins covered the song for his album Going Back in 2010. Haley Reinhart covered the song in an American Idol tenth season performance in 2011. ^ a b Bill Dahl (28 Feb 2011). Motown: The Golden Years. Krause Publications. p. 130. Retrieved 23 September 2012. ^ The Miracles–Depend On Me: The Early Albums liner notes, p. 12. ^ Whitburn, Joel (2004). Top R&B/Hip-Hop Singles: 1942-2004. Record Research. p. 404. ^ Coryton, Demitri; Joseph Murrells. Hits Of The Sixties: The Million Sellers. ^ a b c "With The Beatles". Albumlinernotes.com. Retrieved 2016-09-26. ^ "The Beatles Bible: You Really Got A Hold On Me". Retrieved 2008-11-01. ^ Mark Ribowsky (27 Apr 2010). The Supremes: A Saga of Motown Dreams, Success, and Betrayal. Da Capo Press. p. 176. Retrieved 24 September 2012. ^ Mark Deming. "Begin Here - The Zombies | Songs, Reviews, Credits". AllMusic. Retrieved 2016-09-26. ^ "Classic Sesame Street - U Really Got a Hold On Me". YouTube. 2006-11-21. Retrieved 2016-09-26.